Traveling with a family can be difficult to organize, but we take all the worry out of the planning. This family-oriented tour of England is just what you need! Family escorted tour of England. Just sit back and relax. Your vacation starts at your London hotel. See the highlights of London including the Houses of Parliament, Westminster Abbey, Trafalgar Square and more on your Private Double Decker Bus tour. Take a ride in a private capsule on the London Eye, which offers 360-degree views of the city and surrounding areas; on a clear day, you can see as far as Heathrow Airport and Windsor Castle. In the evening join your fellow travellers for a welcome drink before dinner in your hotel. Visit the Tower of London, a medieval fortress that both served as one of history's most infamous prisons and is the current home of the Crown Jewels. Join up with a genuine expert on Harry Potter for a walking tour that will have you tracing the footsteps of the young wizard. Stop for lunch on your own and this afternoon enjoy a musical in the West End - London's version of Broadway! Enjoy free time in the evening to explore independently. Drive to Salisbury Plain to view the huge monoliths of Stonehenge and learn about how they were built over 4,500 years ago. Next head to Bath to visit the Roman Baths, hot mineral-rich springs that have been popular since Roman times. Audioguides bring the history to life, and the costumed Roman characters provide insight into Roman Britain. Travel to Wales to tour Cardiff Castle, built up over centuries, before enjoying a fun Welsh banquet with entertainment. Drive through the lovely scenery of the Brecon Beacons National Park and continue north through the picturesque countryside of rural Wales. Stop to explore the historic market town of Machynlleth. In the afternoon, visit the Nant Gwrtheyrn Welsh Heritage Centre for a fun Welsh language lesson and a guided tour of the village. At the end of your visit, sample a traditional Welsh tea with your fellow travelers. 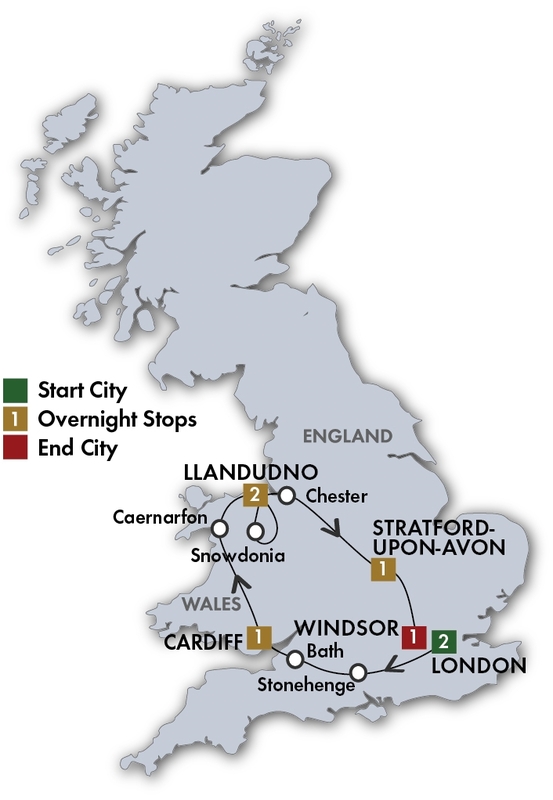 Head to the coastal town of Llandudno and check in to your hotel before dinner. Head to Llandudno, where you will board the old funicular system known as the Great Orme Tramway. This tram will take you through an area rich in history dating to the stone age, and the home of wild Kashmir goats. Next, drive along the North Wales coast the Liverpool, where you will enjoy the British Music Experience to learn the story of British music from the Beatles until today. Drive to your hotel near Chester, where you will have dinner. Travel through the English countryside to Chester, with its old city walls dating back to Roman times, medieval buildings, and Victorian architecture. Stop at the Cathedral to see a falconry exhibition and learn all about this magnifi cent raptor. Visit Shakespeare’s Birthplace in Stratford-upon-Avon and learn about the Bard’s life. Later, take a cruise on the River Avon. See how the magic was made at Warner Bros Studio’s “The Making of Harry Potter” and see original movie sets and some of the props and costumes. In the afternoon, head to Windsor Castle, the largest inhabited castle in the world, and one of The Queen’s official residences, to see the State Apartments and St George’s Chapel. In the evening take a stroll around historic Windsor with a local guide.